Chibi Chibi "The Light of Hope, Sailor Cosmos, Chibi Chibi Moon"
Chibi Chibi appears to be about two years old, and can't really talk yet, though she knows a few simple words and likes to repeat what other people say. In the manga, she mostly imitates the ends of others' sentences; in the anime, she mostly says "chibi". Her red hair is always up in two heart shaped odango with little ringlets sticking out the sides, echoing the hairstyle of protagonist Usagi Tsukino. In each series, Chibi Chibi immediately attaches herself to Usagi's family, whose memories are modified so that they believe her to be the youngest child—almost exactly what Chibiusa had done on her first appearance. Once again, only Usagi's memory is left intact, and because Chibi Chibi has the conversational skill of a toddler the Senshi are unable to question her. Chibi Chibi eventually transforms, under her own power, into a Sailor Senshi. In the manga she is simply named Sailor Chibi Chibi, while in the anime she is called Sailor Chibi Chibi Moon. In the manga, Chibi Chibi transforms by shouting the words "ChibiChibi Crystal Power! Make Up!". This transition is never shown on screen in the anime. The truth of Chibi Chibi's identity is very different in the manga from what it is in the anime, largely because the two series were being produced at roughly the same time. Chibi Chibi's childlike form is really a disguise for Sailor Cosmos, an ultimately-powerful Senshi from the future and Sailor Moon's final form. Chibi Chibi is the starseed of Sailor Galaxia, who had once been a great force for good. When Galaxia fought Chaos, she could see no way to defeat it except to seal it away inside her own body. In order to protect her starseed from being corrupted, she sent it away to Earth, where it finally becomes Chibi Chibi and befriends Sailor Moon. Chibi Chibi is also referred to as the "light of hope" by the Starlights—their one chance for defeating Galaxia. She is able to transport herself and the Senshi around Galaxia's domain freely, and in the end, transforms herself into a Sword of Sealing, the very same sword that Galaxia had used to seal away Chaos. Chibi Chibi's two identities should not be confused with one another. 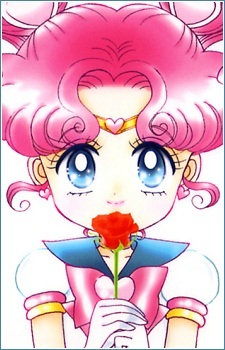 Sailor Cosmos does not explicitly appear in the anime, although a silhouette of Chibi Chibi as an adult is often mistaken for her. In the manga, Galaxia's starseed is not humanoid, nor does it have any connection to Chibi Chibi herself or to Sailor Cosmos.